House remodeling and renovation involve a lot of risks, from family disagreements to skyhigh expenses. In order to avoid those risks, it's wise to get a clear idea of what your future home will look like in the end before investing into construction work or purchasing materials and furniture. Today, this becomes reality thanks to 3D home design software. Your architect obviously has a piece of software like this, but you'd probably spend weeks trying to master that complicated professional program that costs hundreds of dollars. The good news is that there are much more user-friendly alternatives available these days. 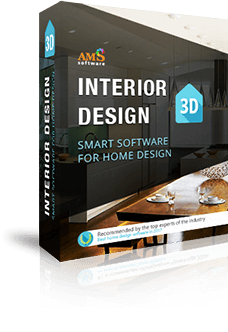 You can download interior design software perfectly suitable for the non-tech savvy. Interior Design 3D is a convenient home design program that allows you to draw your own floor plans as easily as if you were using paper and pencil. It also lets you add ready-made room templates - this way, you can get a floor plan draft in a few mouse clicks. At the same time, the 3D view is automatically generated on the screen. So you'll immediately see what your space will look like before you knock out a wall or install a new window. Download interior design software and find hundreds of materials for home decoration inside! Experiment with wood and fabrics, wallpapers and tiles, stone and parquet, metal and glass - all kinds of textures and colors for any imaginable home design style. Discover the built-in collection of furniture and appliances - there's all you need to furnish any room of your house, from the hallway to the nursery. The software creates a perfect rendering of the interiors you create, enabling you to see how they will look in reality. You can easily switch views to check every minor detail. If the dollhouse view doesn't give you a complete idea of the space, just click on Virtual Visit and find yourself right in the middle of the room you've been designing. Use your mouse or the arrow keys to walk through all the rooms, and invite your family to join in!